Photographer Arabella Spoors, 25, grew up in Christchurch and spent much of her childhood on Banks Peninsula. She came to photography during her high school years. While struggling with an undiagnosed specific learning disability, she found photography, coupled with history and writing, a form of expression, she says, “where there was no right or wrong, just pure creativity, which is a strong point for me that was rarely acknowledged at school.”(2) In 2018 Arabella completed her Honours in Photography at the School of Fine Arts, University of Canterbury. She has since exhibited at Chamber Gallery, Rangiora, and PG Gallery in Christchurch. Her current work, Bloodlines, is part of Place in Time: The Christchurch Documentary Project, established in 2000 at the University of Canterbury’s School of Fine Arts, now under the directorship of Tim J. Veling. Arabella’s work is predominantly documentary based, using photography and text to explore themes around place and personal and cultural identity. Bloodlines is an ongoing project documenting places of cultural and historical significance associated with her Ngāi Tahu ancestry. But connecting the past with ‘here’ (place) and ‘now’ (time) is not always straightforward. The ‘here’ is a cross on a personal map marked with the familiar streets and buildings and travel routes through which we negotiate our lives: home, school, work, shops; the café where we worked, the park where we first kissed. The ‘now’ is a point in the slipstream of our collective and personal history, encoded in timelines of migration and settlement, births and deaths. But what happens when those markers of place are damaged or gone? When the threads of whakapapa are torn? The Christchurch earthquakes of 2011 disrupted the physical framework of ‘here’. Since the September 2010 earthquake, 80 per cent of the buildings in the central city have been demolished. This was the subject of Spoors first photographic project. 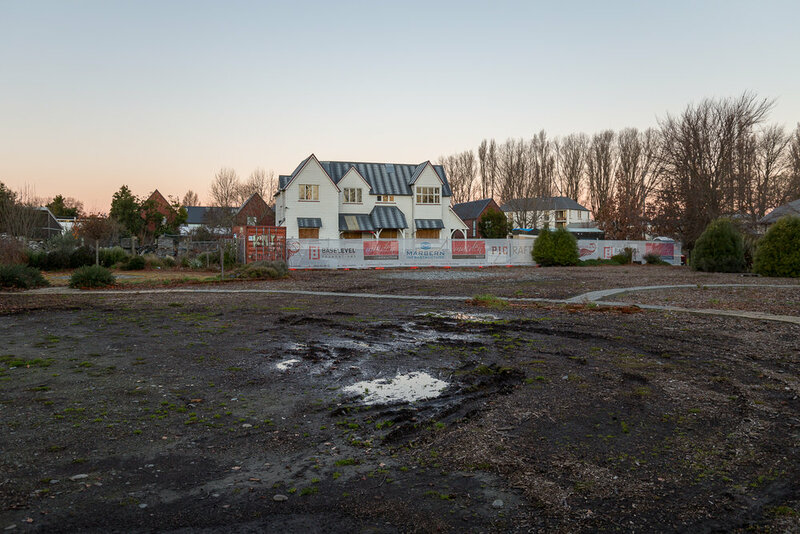 Echoes (2016) documents the empty sites and damaged buildings of the Christchurch city centre and suburbs, the wreckage not just of the city’s built structures but also of the landmarks of Spoors’ personal history. 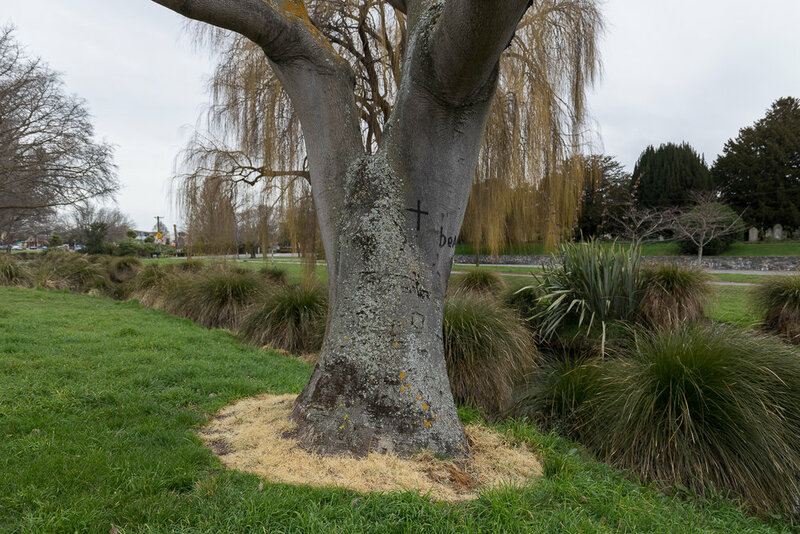 In this series of works Spoors records a number of historical sites in and around Christchurch and Banks Peninsula, sites long disinvested of the physical evidence of their Ngāi Tahu and Ngāti Toa significance. In the city centre, ChristChurch Cathedral, a broken church built over an unheeded urupā, is a dark silhouette in the night; Victoria Square/Ti Tōuka o Puari, once part of a large Māori settlement, spreads out beneath the fronds of willow trees grown from cuttings taken from Napoleon’s grave on St. Helena. An empty, puddled site marks not only the destruction of an inner city church that stood here before the earthquakes but also the erasure of the former burial site of Ngāi Tahu chief Te Potiki Tautahi. Further out of the city, a railway line marches a straight course over the site of the former Ōpāwaho pā to Lyttleton port; the mossy headstones of the cemetery at Woolston/Roimata stand close to the Heathcote/Ōpāwaho River, once a rich source of mahinga kai, later a polluted outflow for the local tanneries. Further out again, the shadowed landscapes and rock formations of Birdlings Flat/Te Mata Hāpuku, Lake Forsyth/Wairewa and Lake Ellesmere/Te Waihora, once rich sources of bird and sea life, appear as evacuated sites on the unmarked map through which Spoors travels. In a brooding overcast landscape the low-lying fortifications of Fort Jervois, built in the 1880s on Ripapa Island, crouch above Lyttelton harbour. 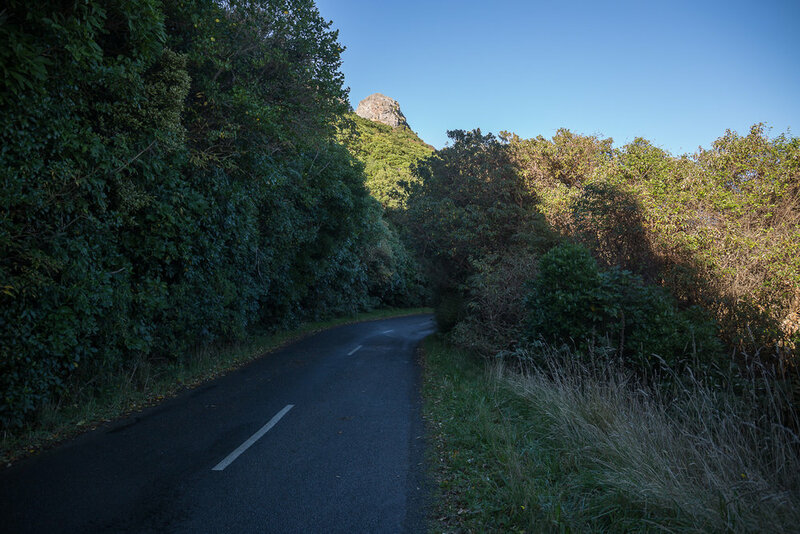 But the stark outline of the hills and the rocky shore hold older memories, the literal bloodlines of the title, when Ngāi Tahu chiefs Te Whakataupuka and Spoors’ ancestor, Te Matenga Taiaroa, attacked a pā, their warriors rolling giant boulders down the hill to crush those trying to escape. In a simple, uncluttered photograph of Pegasus Bay, a sun-striated sand dune, marked only by a single line of footprints, marks the site of Kaiapohia pā, built around 1700 and later sacked by Ngati Toa chief Te Rauparaha. Illuminated in late afternoon sun or early evening, these abandoned beaches, grassed headlands, graffitied bridges, shrouded hillscapes and patches of straggly bush hold the stories of pre-European Ōtautahi Christchurch and Spoors’ own family, stories long silenced, written out and over but here re-invested with the rich history of settlement, war and whanau that completes the picture of here and now. The walls close in, the family line reconnects. In Bloodlines Spoors reveals that connection to the past through the landscapes of her ancestors, locating the “missing teeth” of family history within a territory that has been occupied, written over, damaged and, here and now, re-examined in a series of atmospheric yet understated photographs. Sally Blundell is a Christchurch-based journalist and arts writer.